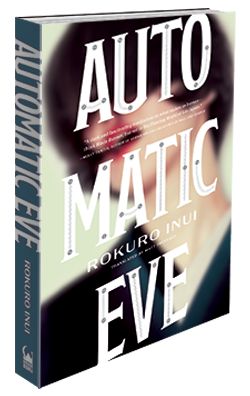 ﻿ Automatic Eve « Haikasoru: Space Opera. Dark Fantasy. Hard Science. THE POLITICAL CHESS GAME BETWEEN THE SHOGUNATE AND THE EMPRESS HAS A NEW PIECE—A SELF-AWARE, AUTONOMOUS ENTITY NAMED EVE. A mighty shogunate ruling the land from Tempu Castle. An imperial line with strict female succession. Caught between these two immense powers, the sprawling city of Tempu is home to many wonders—not least a superhuman technological achievement in the form of a beautiful automaton known as Eve. When a secret that threatens to shake the imperial line intersects with the mystery of Eve’s creation, events are set in motion that soon race toward a shocking conclusion. A new astonishingly inventive science fantasy masterpiece of historic proportions. Rokuro Inui was born 1971 in Tokyo. In 2010, he won the Konomys Award for Kanzen Naru Kubinagaryu no Hi (A Perfect Day for Plesiosaurs) and the Asahi Period Novel Prize for Shinobi Gaiden (Ninja Legend). His other books include Oni to Mikazuki (The Ogre and the Crescent Moon), the Takano Clinic series of mystery novels, and Leipzig no Inu (The Dog of Leipzig).